**Two-colour risographed sleeves on recycled stock. 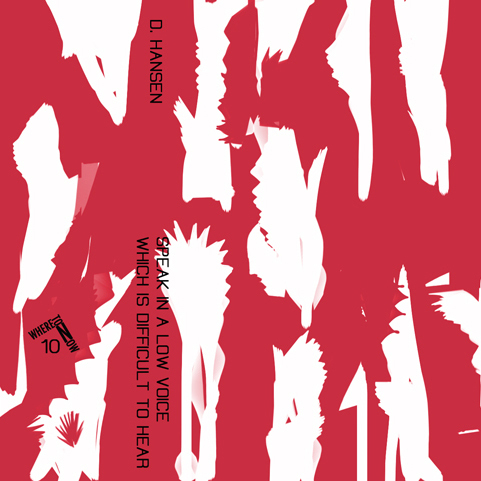 Edition of 50** Brighton's ever-excellent Where To Now debut Devon Hansen's skillful concrète craftwork in the engrossing 'Speak In A Low Voice Which Is Difficult To Hear'. Taking a step away from the beat-oriented output of his Lotide guise - last heard on Astro:dynamics' 'Moonless' album, this piece of work is equally comparable with mid-century avant-garde and concrète by the Pierres as the contemporary works of Jar Moff, Helm and Bruce Gilbert. Field recordings are twisted, serrated and re-sculpted into amorphous structures across the A-side, against a roiling, near-tribal percussion, making right angled transitions into more abstract zones full of tense, elastic rhythms to desolatezone of minimalist subbass and cold drones. Side B feels even more like it was recorded in Paris circa 1960s, with ten minutes of sharp cut experiments in rhythmic dynamic and tape warped bleeps. Recommended.